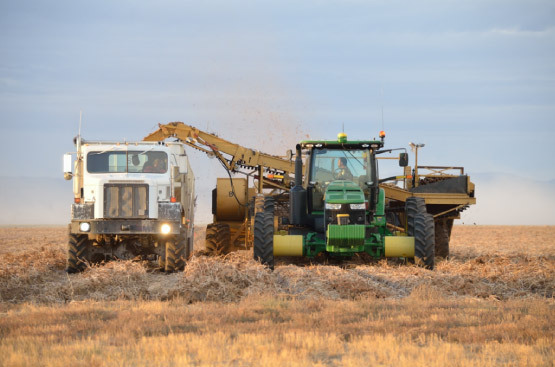 When Blaine Larsen put his money down on 80 dry acres of Idaho desert, folks thought he'd never have a crop worth selling. What no one knew was the same ancient forces that created nearby Yellowstone Park had also created the perfect conditions for America's #1 potato-soft, volcanic soil, unlimited mountain water, lots of warm days, and plenty of cool nights. When people saw Mr. Larsen's potatoes, they were amazed. When they tasted them, they were sold. So Mr. Larsen's farm grew, and so did his passion for perfect potatoes. And so did his children. As they worked the land together, the family focused on serving its customers and growing the best potatoes in the world. professionals whose expertise ranges from biochemistry to marketing to—of course—farming. We are proud to claim America's #1 potato. Welcome to Larsen Farms.